On March 20th, the International Day of Happiness, LG Electronics celebrated the one-year anniversary of the launch of their Life’s Good: Experience Happiness initiative to deliver Sustainable Happiness Skills to teens around the U.S. With the help of leading educational institutions CASEL, Greater Good Science Center at U.C. Berkeley and Discovery Education and nonprofit partners Inner Explorer and Project Happiness, LG has reached 1.8 million teens and is well on their way of reaching their goal of 5.5 million over 5 years. For this milestone, Matchfire was tasked with creating a memorable experience to celebrate the accomplishments of the program, its partners over the past year, and the International Day of Happiness. The activation needed to feature the program’s Six Sustainable Happiness Skills—Mindfulness, Generosity, Gratitude, Purpose, Positive Outlook, and Human Connection—and take Experience Happiness out of the classroom, introducing it to a wider audience with the message that these are skills can work for people of all ages. The activation would also need to be fresh, newsworthy, never-been-done-before, have the potential to reach a wide audience, and represent the LG brand. Matchfire forged a partnership with Daybreaker, an organization with a tight-knit community of 500,000+ worldwide that hosts morning dance parties centered around starting the day with energy and intention. From planning to execution, Matchfire led the LG and Daybreaker teams along with digital PR agency, MBooth, and HS Ad to produce a three-hour experience based on happiness, Spring rise, and the Six Sustainable Happiness Skills. The celebration took place 1,776 feet in the air at One World Observatory in New York City, making it one of the highest elevation dance parties on record. Participants from all around the world started the morning with sunrise yoga and a meditation session with a view of the entire city. Attendees took home Experience Happiness-themed yoga mats and intention cards. 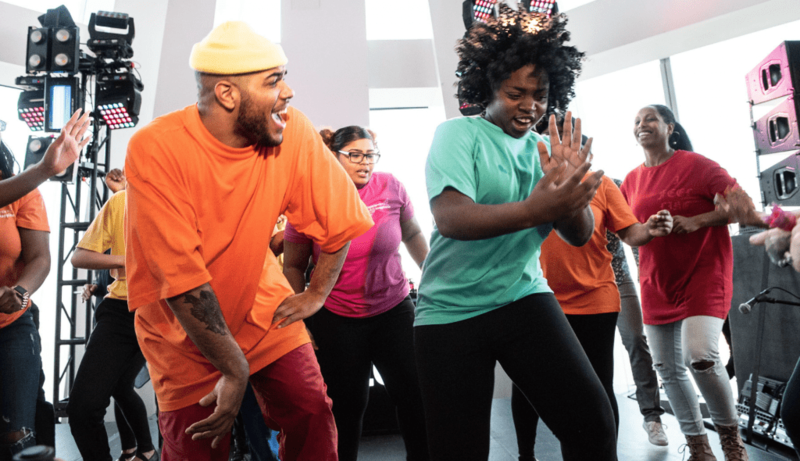 This led into a two-hour, high energy dance party with 400 attendees including influencers, top international DJs, and surprise performances from Instagram sensation Donte Colley and Glee’s Matthew Morrison. Daybreaker also designed and built six activation stations around the event that highlighted each Sustainable Happiness Skill. To cap off the morning, Dave VanderWaal, Senior Vice President Marketing, LG Electronics, Carolyn McGuffog, Superintendent, Greenburgh North-Castle School District and Noelle Contey, Project Happiness Ambassador shared some words about the importance of addressing the issue of teen mental health and the impact the program has had in its first year. As attendees departed the event, they were treated to LG Experience Happiness swag bags with t-shirts, rose-colored positive outlook sunglasses, stress balls, and literature to learn even more about the program and its partners. One of the highlights of the event, was a “happy dance” performed by ten students from the Greenburgh North-Castle school district. These students were specifically chosen by their superintendent because of their incredible stories of overcoming severely challenging backgrounds and their commitment to choosing happiness in the face of adversity. A week before the event, they were surprised by LG, Daybreaker, and Matthew Morrison who arranged for celebrity choreographer Luam to teach these incredible students the happy dance created specifically for the event. This school district will also be participating in the LG Project Happiness Club program this year. This event was promoted first to the Daybreaker community and sold out in less than two minutes, with a total of 400 attendees. All ticket proceeds went to Experience Happiness partner—Inner Explorer—an organization dedicated to helping students prepare for learning with daily mindfulness practices. The event was covered in major media garnering 172 million media impressions, 2 million social engagements, and 16 million social reach. Press included MSN, People, Ok!, PR Newswire, AOL, Extra, Wonderwall, and Yahoo. The Matchfire team was truly honored to be a part of this amazing experience and are excited to play a role in its continued growth. To learn more about the Sustainable Happiness Skills and becoming involved with the LG Experience Happiness program, visit LGExperienceHappiness.com.